Sometimes the simplest things are the best. And I think that spaghetti with a simple tomato sauce is one of them. Just the taste of pure, ripe tomatoes. Not overcooked and not overly complicated. Recently, there was a book published (which I haven’t read) regarding the choice of last meals for chefs (apparently that discussion is popular among chefs). Apparently, the most common selections are simple, classic foods (with Mario Batali a notable exception). I would like to think that spaghetti al pomodoro would be a similar meal. Would it be my choice for a least meal? I don’t know. I don’t particularly relish the idea of devising a last meal. In any case, I do like simple tomato sauces on pasta. There’s something both comforting and tasty about it. I’ve tried a number of different techniques and, while I still like a complicated ragú based on my grandmother’s, I think I’ve found a good option for a simple and fresh version. This recipe really depends on the freshness of the tomatoes. I really don’t think it would nearly as well with canned tomatoes (even San Marzano). When we went to the Santa Monica Farmer’s market, I found several smallish tomatoes that were advertised as being especially for sauce. Given that I only ever really use tomatoes for sauces, I figured they’d be a good choice. This is fundamentally a simple recipe. The hardest part is making the pasta but that could be easily replaced by factory pasta. My technique for pasta making comes mainly from experimentation. I have found that a ratio of 1 cup of King Arthur all purpose flour to 1 extra-large egg (the size of the egg is important). This is not the ratio recommended in any cookbook I’ve ever found (most recommend using large eggs but extra-large eggs are cheapest atTrader Joe’s). I don’t know how important the brand of flour is. I always make my pasta by the well method as it doesn’t seem worth dirtying my mixer bowl. I wouldn’t recommend rolling the pasta by hand. I tried once (before I had a pasta maker) and it was a disaster. Without a pasta maker, use factory made pasta. Slice the tomatoes in half vertically and place them in a skillet. Cover the skillet, turn the heat to medium and cook for 10 minutes. Remove the tomatoes from the skillet and run them through a food mill (alternately, skin the tomatoes and then dice them). 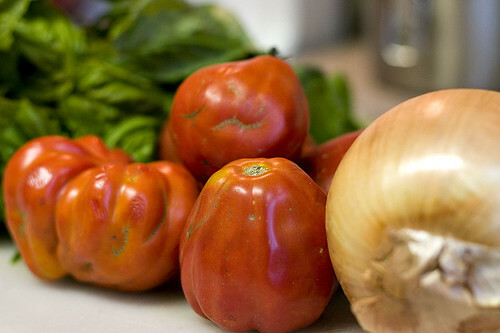 Return the tomatoes to the skillet and add the onion and butter. Slowly simmer over medium heat for 30 to 45 minutes, stirring occasionally. Slightly undercook the pasta in salted boiling water (taste the pasta for doneness). Discard the onion and add the pasta to the skillet and cook for 1 minute more. 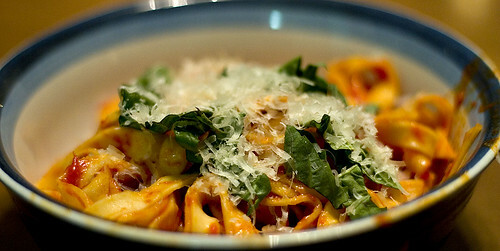 Serve the pasta with slivers of basil leaf and parmesan cheese on top. Place the flour on a board and make a well in the center. Break the eggs into the well. Using a fork, mix the eggs together. Slowly, add flour from the edges of the well. Eventually, the mixture will be too mixed to use a fork. Switch to your hands and mix the eggs and flour together. Once the mixture becomes somewhat homogeneous, start kneading the dough. Knead for several minutes after it has come together. Divide the dough into fourths. Feed each through the pasta maker individually. Start on the largest setting, feed the dough through, then fold in half, and feed through again. Repeat until the dough has become uniform. Feed the dough through the pasta maker at smaller settings until reaching the desired thickness (on the Kitchenaid Pasta Maker this is 6 for spaghetti for me). It should go through at least four settings on the pasta maker in total. Sprinkle flour on each piece of dough so it doesn’t stick. And remember, when determining thickness, the pasta will approximately double in width when it’s cooked. Cut the dough into the desired shape (I use the larger pasta cutter for the spaghetti al pomodoro). Coil the pasta together and sprinkle with flour so it doesn’t stick. Cook the pasta in salted boiling water. It will be done about 2 to 3 minutes after it floats to the top. Serves 1 per egg/cup of flour. Hi Matt! I am a reader of Angela’s blog and She directed us all over here, whether intentionally or not. But I cook and have blogged about cooking so I think I will read both your blogs. You have also inspired me to take better notes on my cooking and I added the Last Supper book to my Amazon Wish List! Great! Thanks for your blog and I’ll catch up on your past posts! Hi Angela! Thanks for the pasta-making tips. I have a huge basil plant, and as the weather is about to turn too cold for it to stay alive, I was hoping to make pesto — and also to essay my first attempt at making pasta. I’ll keep this post in mind when I head to Trade Joe’s for my eggs! I love this recipe! We have an Italian friend who makes this all the time, and now my husband makes it, too (although not with fresh pasta like yours!). I can’t wait to check out some of your other posts. Very nice photos, too. Funny, but I thought that baguette shot was the thumb of a rubber glove holding a washcloth, at first glance. I have no idea why! Thanks for the beautiful pasta recipe! It’s a bit different than i’ve done, so i’m excited to give it a try! i’ll have to add, though that i prefer to buy eggs at a local co-op, or from a local farmer. When it comes to things like this- ‘cheaper’ is usually far more costly in the long run. 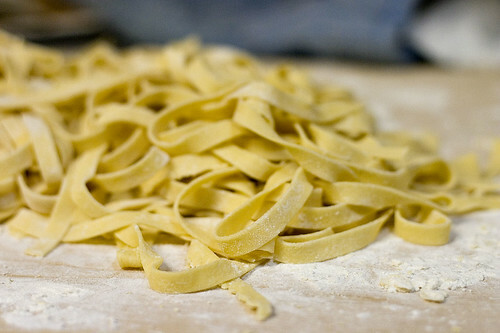 I think a last meal should definitely include freshly made pasta, it’s the best! One thing I should’ve put in the pasta making section (and I probably will) is to remember that pasta expands significantly when it’s cooked. So it may look really thing when you roll it out but it’s going to double in width when it cooks. waltzingaustralia – I’m not allowed to make pesto as my wife doesn’t like it (well, I can make it but I don’t see the purpose in making things she dislikes). Traditionally, pesto is served with a very broad noodle so you’d probably have to cut it by hand. 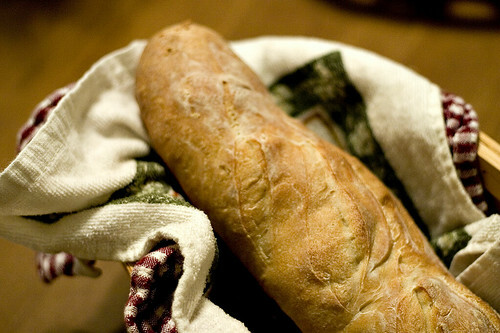 paperseed – The baguette is definitely a baguette (it’s probably closer to a batard in size but who’s counting?). I usually don’t put too much effort into shaping bread when I make it but I’m going to avoid rubber glove shape in the future. wildsynergy – I wish I could easily afford organic free range eggs. The ones sold at the farmers market are about triple the price of the ones at Trader Joe’s. I’m not sure if it’s 3x as good, particularly for how I use them (mostly in things like pasta or baked goods where eggs don’t provide a lot of the flavor). Maybe I should do a taste test. Wow thank you for the recipe and your blog rocks! Wow, this pasta looks delicious! I didn’t think spaghetti with a plain sauce would be my choice…until I saw that picture. yum. Sounds just like the thing I would love! However, isn’t this tagliatelle rather than spaghetti? I suppose it would be technically closer to tagliatelle. According to KitchenAid, the cutter I used is actually for fettucini. Allow me some artistic license in calling in spaghetti. And there’s no garlic in this recipe. I don’t think it really needs it either. This recipe is really a celebration of fresh tomatoes. It’s also a bit more northern Italian where they aren’t as fond of garlic. YAY! FINALLY, a recipe Without Garlic! I am allergic to garlic and it seems everyone cooks with it these days. Going to a restaurant for me is always embarrassing with my speech to the waiter and subsequently either the chef or the manager about how I can’t have garlic in any part of my meal. Thank you for posting this. I am going to try it this Friday with Fishcakes.